Automate and Accelerate Your Mobile, Web and Windows Software Development. Accelerator is a comprehensive end-to-end software development solution that drives faster development with better quality & more functionality to deliver Software that people love! Surround is home to some extraordinary developers. 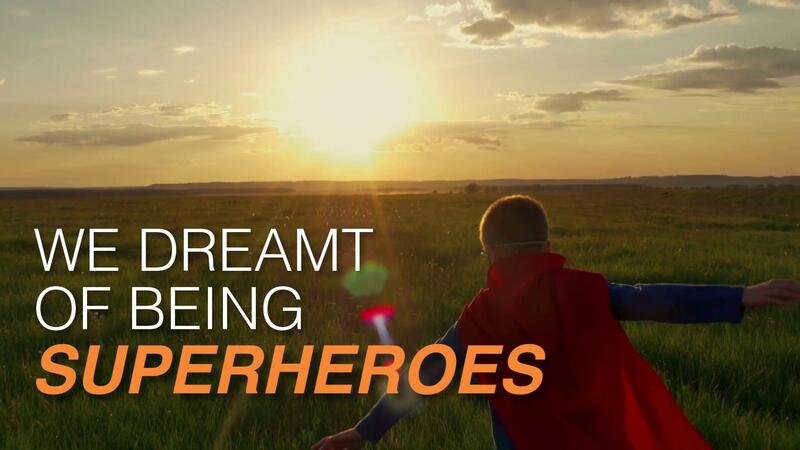 Customers have been known to suggest they are superheroes when it comes to delivering software they need. Unfortunately, we do not actually possess super powers. But we did create the tool that may have people looking for a cape in your closet. Very early on, Surround's founders knew that to achieve their vision we needed to innovate. We needed to create tools to accelerate software development, and we mean much more than just doing it faster. We needed to deliver better results and more functionality. Ultimately, we wanted it all, so we had to create the strategies and the tools to help us work smarter! The result is our Accelerating Software Development strategy and our supporting toolset, Accelerator. In a world where results are what matter most, Accelerator is your answer. You will build powerful applications fast and then change them even faster. The capabilities and high quality of the software you will deliver, the speed in which you deliver it, and the ability for you to adapt it to business changes all with no limitations and no lock-in is what makes Accelerator so distinctly different from all other solutions. For many software projects, developers just sit down and start coding. Very little planning is put into how the software will be architected and built. And, when it is, ask any Architect worth their salt, seldom is it done right the first or even second time. To Architect software well it takes the most advance and experienced developers – people that have done this before and know the pitfalls; that know how the decisions made now affect development throughout the project and throughout the life of the project. It's high risk and User’s don’t care! When done right, the core architecture and software will typically consume 15% to 35% of the overall development and all of it by senior level developers. It is the most costly part of software development by a significant margin, carries a very high level of risk, and, the killer part, it provides very little business related functionality. Most of it the users can’t even see, don’t know it exists and could care less about it, except when the software doesn’t work well and takes a long time to fix because of it. You need software that can quickly adapt to today's rapidly changing technologies and robust enough to stand the test of time. So as the company grows and changes and the requirements expand, the software can grow change and expand with it. At Surround technologies we know that the only way to achieve that is through a solid foundational architecture. An agile architecture that can be quickly adapted to new solutions and that significantly reduces or eliminates maintenance drag. Accelerator provides it ALL so you can eliminate the risk. Accelerator provides ALL of the Architecture and Core Software for you, meaning the hardest, most important, and most expensive part of your software development is done! 15% to 35% of your project done! And done right! Accelerator Developed solutions garner power and agility from the Visionary Core Architecture the Surround Team has created within Accelerator. It acts as a technology abstraction layer, enabling developers to do more by allowing them to focus on business functionality rather than the complexity of the underlying technology, with systems that behave in a homogeneous, unified, consistent and robust manner. Some frameworks provide the primary “plumbing” for a system, some provide the communication, some the facade. Accelerator has many frameworks to provide it all. To relate to the building metaphor, the Accelerator core is the footing, foundation, framing, plumbing, electrical and communications. It will save you development time and related costs now and for many years to come. It will also minimize future maintenance costs and delivery time by providing robust software and eliminating technical debt incurred from rushed unplanned development. 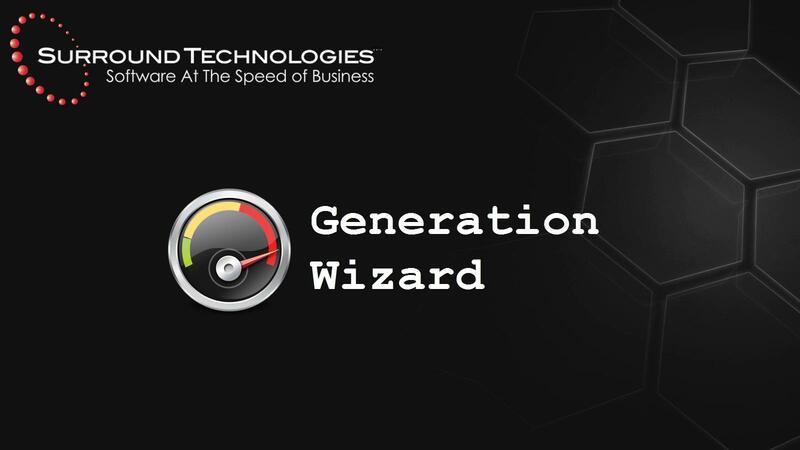 Accelerator's Software Generation Wizards are used to generate complete Systems or individual Applications, Modules and other various parts through easy to use wizards. It generates the custom code that is specific to your database, provides 100% of your Create, Read, Update, Delete and more (CRUD+) functionality, for developers to expand and enrich it further for more specific business related tasks. With Accelerator, the entire comprehensive base software that sits on top of the Accelerator Core is created for you, This is fully functional, near production ready, software generated out of the box without any coding. Accelerator Wizards walk the developers through the process of data storage selection, module relationships and presentation definition. The Wizards then use various frameworks and code generators to produce fully functioning, high quality, state-of-the-art software with open, well-formed and documented code. Surround’s acceleration tools are open as well using our powerful Open Generation Technology. This allows the development team to configure their own development standards, define their own source in the generation templates and specify generation rules and logic based on their database and software needs. With it, you can continually make your software generation smarter, more powerful and more specific to your business needs. Accelerator's loosely-coupled modular architecture provides plug-and-play capabilities for other Accelerator-based or wrapped software and comes with a set of common cross-industry software already built and ready to be plugged into your systems. Application Content Management System — Quickly and easily create application portals for your employees, contractors, vendors, partners and customers and securely manage who can create and maintain content, navigation, images, styling and anything else you define beyond software development and let the creativity flow. Workflow Automation — facilitates the routing of tasks or activities through a sequence of connected steps defined by the business to ensure that work is moved through the system in a timely fashion and is processed correctly by the appropriate user or group of users. It provides information and support for each step of the process and business cycle. Triggers can also be setup to alert executives or process owners when tasks or activities are entering the next step or that the current step is overdue. Document Management — provides a digital filing, sharing & management tool to upload, share, track, group, organize, use and reference any type of document, file or media. Authenticated users can upload files from any device and attach them to any record in your systems where they can be accessed by any other authorized users, streamlining processes and reducing user’s time and frustration looking for related documents. Integrator — provides custom integration interfaces into your systems to do anything from receiving and processing data to submitting or scheduling jobs for your application to run. The Integration Management Console allows you manage the interfaces; monitor, pause and cancel active jobs; and view interface history. HR Job Board and Applicant Management — provides the ability to add job-board functionality to your software applications and web sites, manage job openings, and streamline the process to identify the higher quality applicants that are right for the position. Accelerator HR Jobs Management Application saves time, reduces duplication, enhances consistency, attracts the right talent and simplifies recruiting. Hiring has never been simpler! Remarks Application — provides the ability to attach user, date and time stamped remarks to any records in your system. You can set up remark templates to make it easier for users to enter them as well as automate remarks where the system creates them based on user or system activity. Definitions, Properties and Codes Tables — enables developers and application administrators to create supporting tables of data such as property values, definitions or codes/decodes with out any coding. These tables can be used to convert cryptic legacy codes to user-friendly values, property value look ups or simply as a reference material for the user. As with all of Accelerator, all Code Starts can be customized or further enhanced to meet your specific needs. Code Enhancer — compares database and generated programs to analyze inconsistencies, find errors and optionally update or fix the code. It analyzes added, changed or removed fields as well as differences in types, lengths and names. It updates existing generated code based on rejecting or accepting inconsistencies and can even update code that has already been customized by a developer. Build Manager — Generates a Build Script based on a project dependency analysis across multiple solutions and has command line access for supporting build automation and continuous integration. Third Party Controls — Accelerator comes with a big library of standard controls, but sometimes you just need a little more. Accelerator provides integration with third-party controls to make it even faster and easier to plug them into your systems. There are a vast array of controls available that can be used to create very stunning and innovative user interfaces. Find what works for you and drop it in. As an example, if you need to go beyond our standard grid control, then plug in the RadGridView from Telerik to get built in functionality for grouping with aggregate functions. Need advanced charting, plug in the Telerik’s RadChart. Accelerator provides best-of breed Rapid Application Development, RAD, through advance automation techniques used within an agile process. Analyze, Plan and estimate — Accelerator’s consistent, repeatable, iterative development process makes defining project deliverables and setting expectations a snap. Accelerator eliminates technology challenges and provides comprehensive system functionality through fast out-of-the-box software generation which enables architects and developers to focus on the business deliverables. This same generation can be used to create a fully functional prototype to involve users and stakeholders early on in the project. Also, Use Accelerator’s analysis tools and predictable development activities to accurately size and estimate projects, minimizing missed tasks and unwanted surprises. Generation — With Accelerator, the comprehensive base software is created for you. Accelerator Wizards walk the developers through the process of data storage selection, module relationships and presentation definition. The wizards then use various frameworks and code generators to produce fully functioning, high quality, state-of-the-art software with open, well-formed and documented code. Enrich, extend and integrate — Using the fully functional generated software as the foundational basis, developers can choose to unleash their genius and creativity to enrich and extend it further. Since there are no limitations, you can take the system as far as your creativity can take you and what your business needs are. Add dashboards, productivity task panes, configurable system options, documents management, workflow wizards, advanced information visualizations, and much more. Use more Accelerator frameworks, code generators, tools and pre-built add-ins to accelerate that process too. Renew IBM i and zSeries Interfaces — With the renew option, developers can masterfully integrate refaced existing IBM i 5250 and System z 3270 host screens into new more advanced composite software, repurposing the full functionality. Screen navigation and processes are performed automatically and silently through background transactions. The business function host screens are presented in a graphically enhanced, dynamically derived version of the underlying 5250 or 3270 screen. The default dynamic refacing engine provides the graphical look for the vast majority of screens without any intervention and developers can enrich even further to create highly customized graphical forms. Altogether, developers orchestrate & reface the host screens into encapsulated modern snap-in business functionality and get application integration that combines every system you have into one seamless user experience. Test — Focus testing on your system customizations. The core architecture and base generated system functionality has been through extensive testing by us already. Implement Test Driven Development (TDD) to further automate the testing and validation process. Deploy — Use Accelerator tools to simplify deployments and integrate with other tools to establish a complete continuous integration practice. Monitor, maintain and enhance — Secure, monitor, control and maintain your systems through the Accelerator Maintenance System (also built using Accelerator) and continue to enhance it further using various Accelerator tools. Repeat — Create new modules and add them to your existing systems or create complete new systems with new modules that can be shared with the other systems as well. The Accelerator business value from productivity gains throughout the entire software development life cycle, SDLC, is significant. The Accelerator Server is what ties everything all together for the end solution. Accelerator Core Run Time pulls the core architecture and frameworks, the generated and custom coded software and the system metadata together to provide a high performing unified user experience in Windows, web and mobile applications. Accelerator Services securely exposes all of the Accelerator configuration, operation and administrative services to other applications where and when it is needed. Operation Management and Administration is a complete system developed using Accelerator itself. It provides full security, system management and administration, and system monitoring, control, and performance tuning. These administrative functions can also be plugged in and integrated with your own system, pulling in your information and providing even greater operational control. Software Configuration Services provide system, application and module level information that is used by the presentation layer to visualize the system and deliver the dynamic, adaptive, robust user experience. You can configure system preferences and options; system navigation including Menu Navigation, Favorite and Recent Modules and Tabbed Navigation; system and user options, skin and theme settings, logging, and user information. While this is a runtime portion of the Accelerator solution, it is packaged together and deployed with your own systems. And, as with all of Accelerator, it is 100% .NET and you get 100% of the source code. Develop what you need at your pace when you need it. Rapidly deliver Responsive Web/Mobile, Native Mobile and Native Windows Applications. Evolve legacy systems to new modern applications at your pace. Combine new, legacy and other systems into one seamless unified user experience. Stop building more legacy and accumulating even more technical debt. Advance developer skills, learning the most modern technologies quickly. Use best practices software design and architecture. Have superior application performance and reliability. Eliminate your change request backlog. We are excited to speak with you about your project objectives and needs. Whether you’re in the planning phase, are ready to get started or well into the project, we’re here to help you reach your goals and discuss ideas about how you can super-power your software development and modernization. Choosing a product to guide the growth of your companies’ software and IT infrastructure is a big task with many variables to consider. So we’ve decided to find out why our clients chose us above the rest. 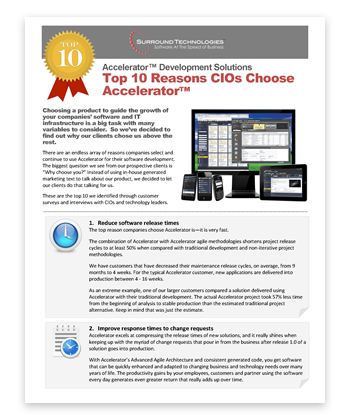 There are an endless array of reasons companies select and continue to use Accelerator for their software development. The biggest question we see from our prospective clients is “Why choose you?” Instead of using in-house generated marketing text to talk about our product, we decided to let our clients do that talking for us. These are the top 10 we identified through customer surveys and interviews with CIOs and technology leaders. Quickly adapt to changing technologies.